7/8 size guitars are not only made for kids and youth but also for young women with small hands. It is just a bit smaller than a full size guitar but in that way it facilitates the playing for people with small hands. For kids this guitar size is often ignored but many teachers think it is alright to go for a 3/4 or a full size guitar. I can only partly agree on this opinion. 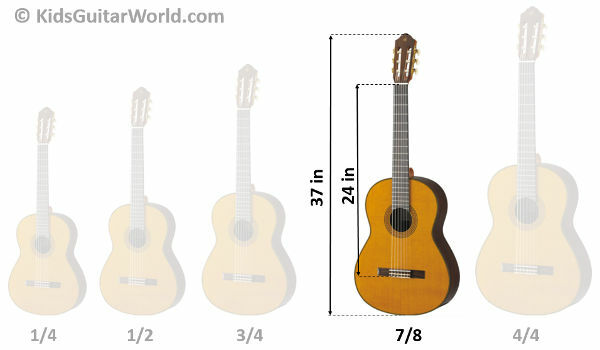 If you are woman with small hands looking for the right guitar and your height is between 4’11” and 5’3″, then a 7/8 size guitar is a good choice for you. A distinction needs to be made between children who are already playing guitar and those who just want to get started. In case your child has got already a 3/4 size guitar I recommend you not to buy a new 7/8 guitar. It’s not worth it since he can also play on this guitar size the next years. It will be just the right size for some years and then he wants to get anyway a full size guitar. You do better keeping the money and to invest a bit more in a full size guitar once your child has the right height for it. However, if it will be the first guitar for your child and he meets the criteria for this guitar size (student’s height: ~ 5’1″) then think about getting a 7/8 guitar. In my opinion it’s important to get the right size first guitar for a child to make sure that it fits just perfectly. Nothing is more frustrating to start learning on a too big instrument. One of my favourite guitar brand for beginners and kids guitars is Yamaha. You see them in every guitar classes and in nearly every guitar shop. They really offer great quality guitar for a very fair price. I have never seen a bad instrument from them. The Yamaha CS40 II is a very popular student guitar with a spruce top and a gloss finish. 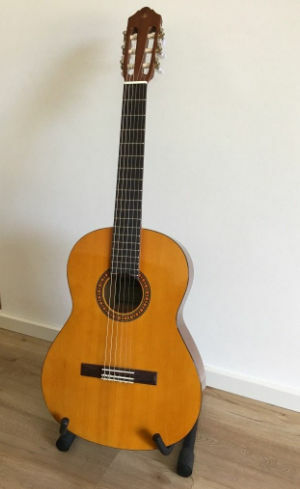 If you are looking for a nylon string beginner guitar then get this model. Guitars from Yamha are long lasting guitars with a good rich sound. The guitar comes with all necessary equipment, such as gigbag and tuner, which are essential to get started. You are not looking for an entry level guitar but already for a high quality instrument. In this case, take a look at the Cordoba Dolce 7/8. This model comes with a solid cedar top which ensures a great and full sound. In addition to that, the Cordoba guitar is really beautiful thanks to its deep and rich coloring wood. There are not really too many 7/8 size steel string guitars out there. If you are looking for a small high quality steel string guitar I would recommend you rather the Baby Taylor or the Martin LX 1 but which are both 3/4 size guitars. If you are looking for a simple entry level guitar the Rogue Starter Acoustic Guitar could be interesting for you. The price is incredible low for an steel string guitar and moreover it comes with high quality strings from Martin. You can’t find a better steel string guitar in this price range. Same as with steel string acoustic guitars: there is no a big choice on the market. Either you take a look at the 3/4 Squier Mini Strato from Fender which is in my opnion one of the best small electric guitar or you may want to take a closer look at what SX offers. SX is not a really well-known guitar manufacturer but htey offer a 7/8 electric guitar. The SX GE is available in different colors and comes with a gigbag and some stickers. I quite like the little addon with stickers which gives kids the opportunity to personalize their instrument.